(SPOT.ph) Getting caught up in the holiday rush is inevitable, but even though you're tired from all the shopping and traffic, there's still noche buena and media noche to look forward to! 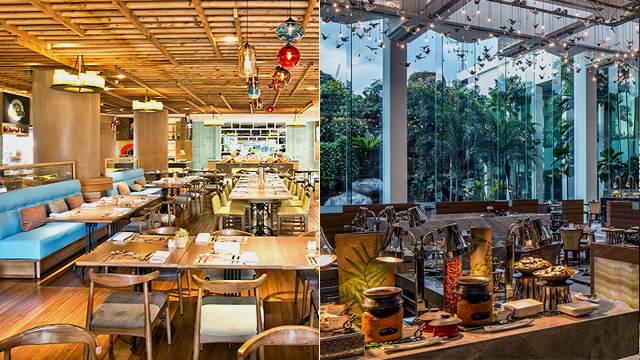 If you're going out with a group with big appetites and different food favorites, here are some hotel buffets that might make your holidays even merrier. Shangri-La Hotel in Makati offers afternoon tea with a live orchestra. At the Sunday Grill Buffet, you’re treated to a spread of Spanish sparkling wine, Josper-grilled sirloin and tomahawk steaks, Boston lobster, scallop ceviche, beef carpaccio, Cajun-style king prawn skewers, lobster bisque with truffle, and more. Meanwhile, Circles Buffet has a selection of specialties from cold appetizers to seafood, Western to Asian cuisines, and desserts. P1,200 for the Luxe Merienda Cena Buffet, available every weekend until December 25 from 3 p.m. to 6 p.m.
P2,680++ for the Sunday Grill Buffet at Sage Bespoke Grill, available until December 31 from 11 a.m. to 2 p.m.
P1,800 for lunch every Monday to Saturday and P2,150 every Sunday at Circles Buffet, from 11:30 a.m. to 2:30 p.m.
P2,100 for dinner every Monday to Thursday and Sunday, and P2,350 every Friday and Saturday at Circles Buffet, from 6 p.m. to 10 p.m.
Makati Shangri-La is at Ayala Avenue corner Makati Avenue, Makati City (814-2580). If you’re craving Filipino flavors, there’s plenty of affordable options at The Legend Villas’ Lola Maria Restaurant. 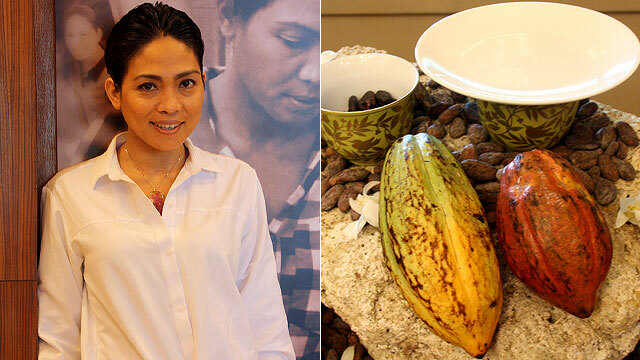 They offer festive, home-style dishes from different regions of the Philippines. P750 net for the Holiday Eve Special Dinner Buffet, available on December 24 and 31 from 6 p.m. to 10 p.m.
P420 for the Filling Fridays Buffet, from 7 p.m. to 10 p.m.
P390 (breakfast), P590 (weekday lunch), and P480 (weekend lunch) for the Buffet Espesyal, from 6 a.m. to 10 a.m. and 11 a.m. to 2 p.m. 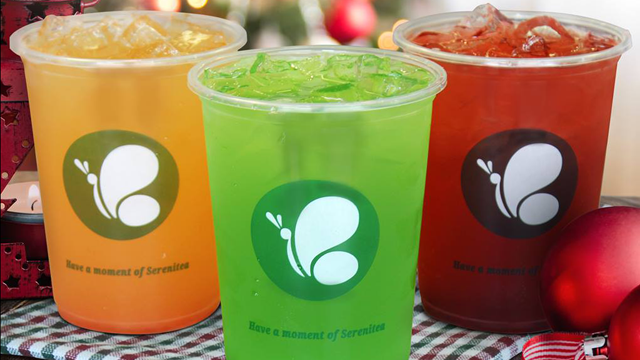 The Legend Villas is at 60 Pioneer corner Madison Streets, Mandaluyong City (702-2793). 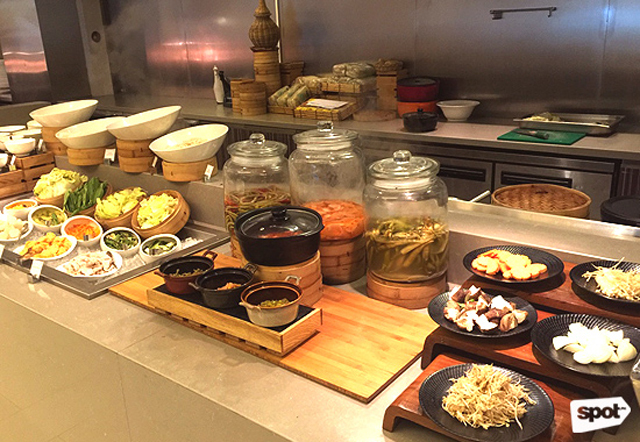 Marriott Café serves Asian, European and American cuisines so you’ll have a guaranteed feast throughout the day. 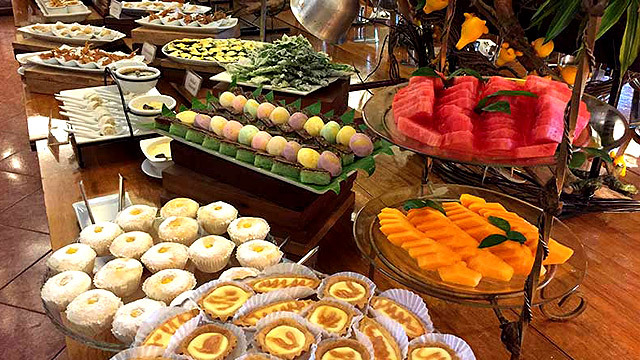 P1,450 for breakfast daily from 6:30 a.m. to 10:30 a.m., and P2,500 every Sunday from 11:30 a.m. to 3 p.m.
Marriott Hotel is at 10 Newport Boulevard, Newport City Complex, Pasay City (988-9990). 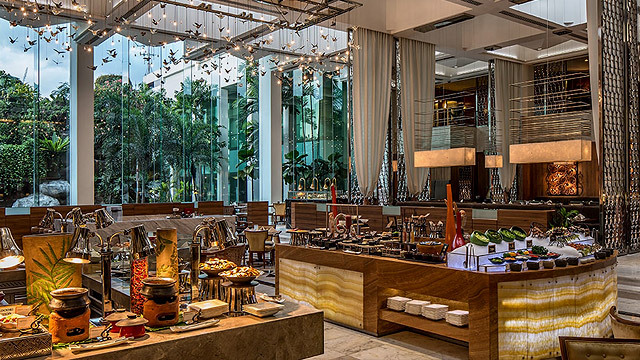 Offering masterful flavors ranging from Indian, Italian, Filipino to Pan-Asian cuisines, Dusit Thani’s The Pantry uses organic and locally sourced fair trade products and ingredients. P2,950 for Christmas Day lunch, from 11:30 am to 2:30 p.m.
P1,450 daily for breakfast from 6 a.m. to 10:30 a.m.
P1,850 for lunch every Monday to Thursday, and P2,300 every Friday to Sunday from 12 p.m. to 2:30 p.m.
P2,100 for dinner every Monday to Thursday, P2,350 every Friday and Saturday, and P1,850 every Sunday from 6 p.m. to 10 p.m.
Dusit Thani Manila is at Ayala Center, San Lorenzo, Makati City (238-8888). 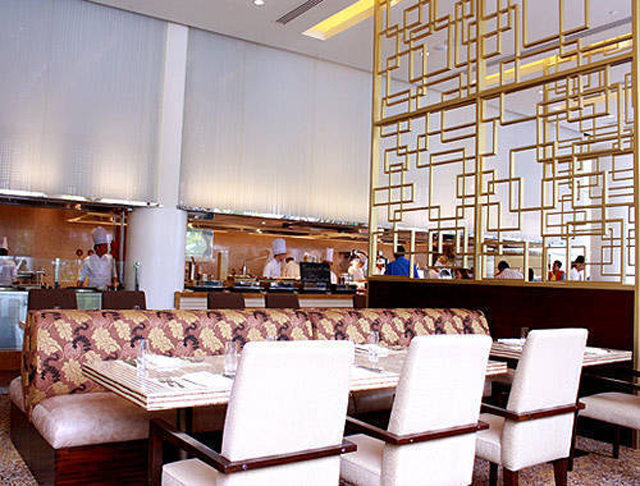 Spectrum is an all-day restaurant with cuisines from China, the Middle East, India, Europe, as well as local dishes. 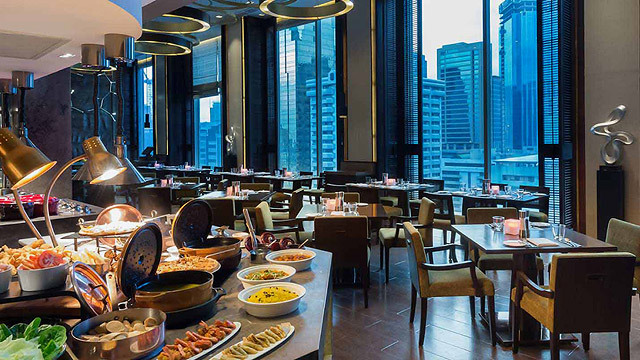 P2,380 for dinner every Sunday to Thursday and P2,450 every Friday and Saturday from 6 p.m. to 10 p.m.
Fairmont Hotel is at 1 Raffles Drive, Makati Avenue, Makati City (795-1840). 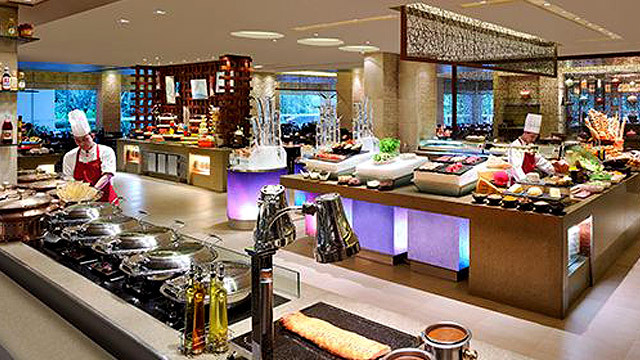 This extensive buffet features Asian, Indian, Italian, and Japanese food, as well as two dessert stations. Your eyes are sure to wander over to the selection of sweets, so make sure to leave lots of room for those treats. Novotel is at General Aguinaldo Avenue, Cubao, Quezon City (990-7888). 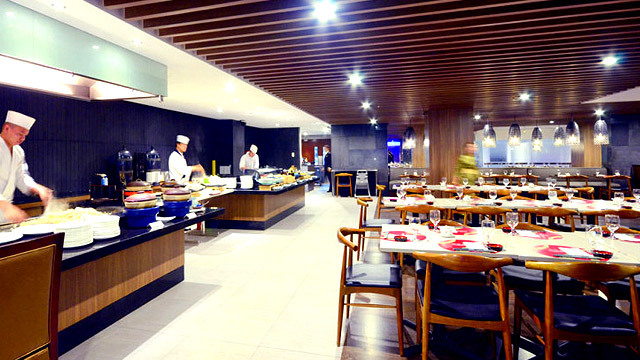 Cucina has interactive open-kitchens which features innovative Continental and Asian cuisines. 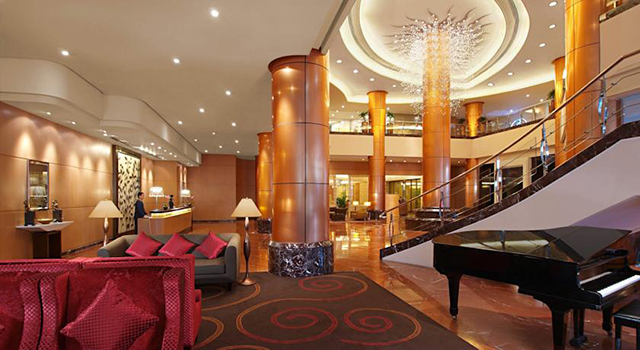 Marco Polo Hotel is at Sapphire Street, Pasig City (720-7720). High Street Café offers five cuisines: Western, Pan-Asian, Chinese, Japanese, and Mediterranean. Aside from the seafood bar, salad bar, and dessert station, it also features a make-your-own hot chocolate station, a liquid nitrogen station, and Grand and Go—a breakfast-on-the-go trolley. High Street Café also takes pride in its full rotisserie station. P1,550 for lunch every Monday to Friday from 11:30 a.m. to 2:30 p.m. and P1,750 every weekend from 12 p.m. to 3 p.m.
P1,900 for dinner every Monday to Thursday and P2,100 every Friday to Sunday, from 6 p.m. to 10:30 p.m.
Shangri-La at The Fort is at 30th Street corner 5thAvenue, Bonifacio Global City (820-0888). 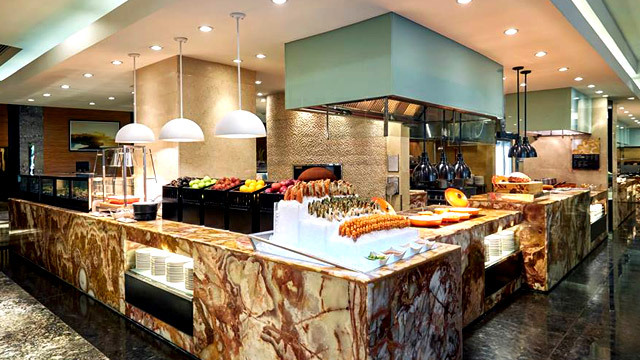 This buffet has plenty of cuisines ranging from Asian, Mediterranean, European, to Western. The historic hotel will keep your minds and appetites filled with lots of worthwhile delights and flavors. P1,450 for daily breakfast, from 6 a.m. to 10:30 a.m.
P2,450 for dinner every Monday to Wednesday and Sunday, P2,995 every Thursday, Friday, and Saturday from 6 p.m. to 10:30 p.m. The Manila Hotel is at One Rizal Park, Ermita, Manila (527-0011). 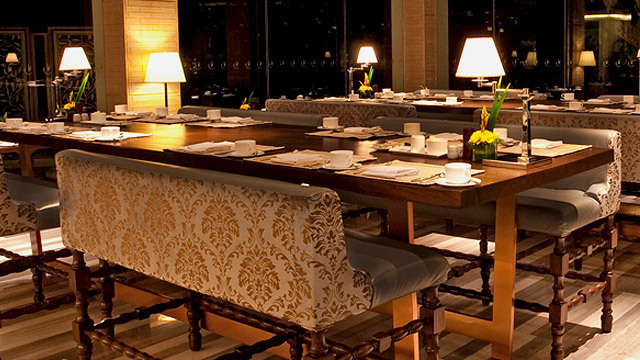 F All Day Dining Restaurant offers a wide selection of international cuisines. Each dish is guaranteed authentic, and cooked by world-class chefs. P1,888 for the New Year Countdown Party unlimited drinks on December 31, 2016, from 10 p.m. to 1 a.m.
F1 Hotel Manila is at 32nd Street, Bonifacio Global City 908-7888, 928-9888). 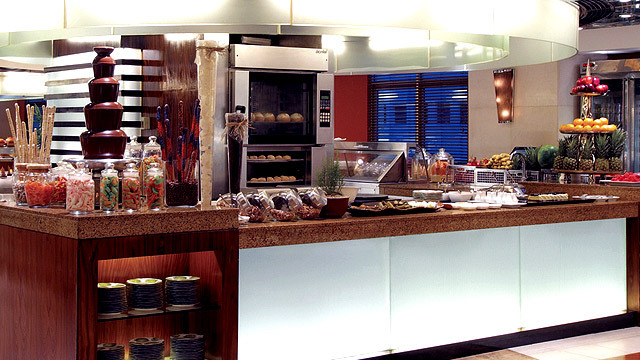 The Lounge is offers international cuisine at breakfast, lunch, and dinner, as well as a range of cooking stations and mouthwatering carvery for their holiday feasts. 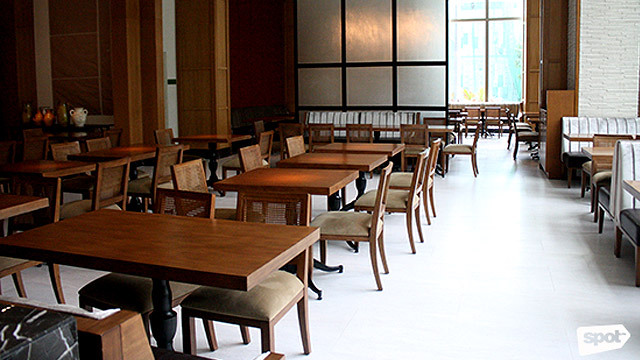 P680 for the daily breakfast buffet from 6 a.m. to 10 a.m.
Eastwood Richmonde Hotel is at 17 Orchard Road, Eastwood City, Bagumbayan, Quezon City. For reservations, call 570-7777. 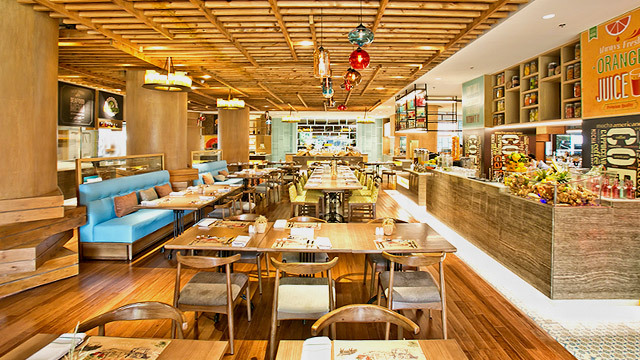 Market Café's open-kitchen preps also doubles as a form of entertainment for diners. Ingredients are guaranteed fresh, featuring Chinese, Japanese, Western, Korean, and Filipino dishes. P2,016 for Christmas Eve and Christmas Day dinner from 6 p.m. to 10 p.m.
P2,017 for New Year’s Day lunch on January 1, 2017 from 12 p.m. to 2:30 p.m.
P1,200++ for daily breakfast from 6 a.m. to 10:30 a.m.
P2,000++ for lunch every Monday to Saturday, from 12 p.m. to 2:30 p.m., P2,500++ every Sunday, from 11:30 a.m. to 2:30 p.m.
New World Manila Bay Hotel is at 1588 Pedro Gil Corner M. H. Del Pilar Street, Malate, Manila (252-6888). Yanagi is perfect for anyone who loves Japanese cuisine. Make sure to check out the resto’s sushi and teppan menus. P1,485 for lunch every Friday to Sunday from 11:30 a.m. to 2:30 p.m.
P1,485 for dinner very Friday and Sunday from 6 p.m. to 10 p.m.
Midas Hotel and Casino is at 2702 Roxas Boulevard, Libertad, Pasay City (902-0100). HEAT boasts sumptuous Asian and continental specialties, as well as two outdoor patios overlooking the garden and the pool. P4,088 for Christmas Eve dinner from 6 p.m. to 10:30 p.m.
P3,400 for Christmas Day lunch from 12 p.m. to 2:30 p.m. and P3,200 for Christmas Day dinner from 6 p.m. to 10:30 p.m.
P1,890 for lunch every Monday to Saturday and P2,500 every Sunday, from 12 p.m. to 2:30 p.m.
EDSA Shangri-La is at 1 Garden Way, Ortigas Center, Mandaluyong City (633-8888). The Diamond Hotel’s main restaurant showcases a garden view and exquisite rock formation with a cascading waterfall. As you eat your way around the Asian, Western, Japanese, salad, and dessert stations, you're also treated to a bit of nature. The Diamond Hotel is at Roxas Boulevard corner Dr. J. Quintos Street, Manila (305-3000, 528-3000). 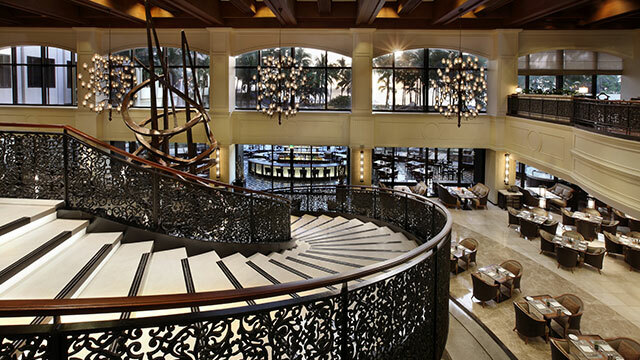 With its 21 dining ateliers, there’s something for everyone at Spiral. Indulge in several different types of hams and cheeses from the famous Cheese Room, have your fill of fresh sushi or seafood, or feast on Mediterranean favorites in between enjoying a selection of dim sum—trust us, you’ll want to try everything. 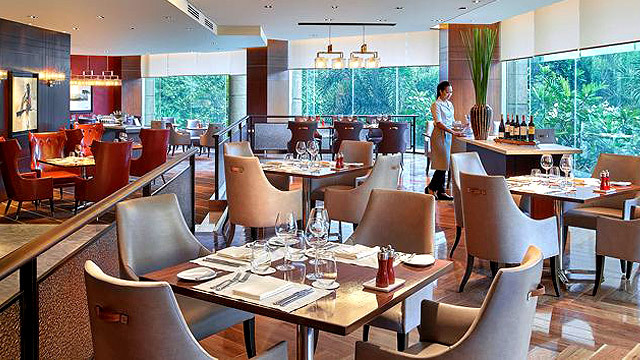 P5,300 for dinner on December 24 from 6 p.m. to 11 p.m.
Spiral is at Sofitel Philippine Plaza Manila, CCP Complex, Roxas Boulevard, Pasay City (832-6988).